As many of you know, I’m the author of the popular Jana Lane mystery novels set in the decadent and wonderful 1980’s. What you might not know is that countless readers have told me the novels should be adapted into a television series. I agree! So, while I wait for Hollywood to call, I wrote a television treatment and pilot for the series. I also decided to do the next best thing: adapt the novels into audiobooks. That presented quite a challenge. How could I find an audiobook performer who would perfectly voice all the eccentric characters, key into the humor, understand the pacing of the suspenseful plot twists and turns, and handle the shocking and mind-blowing endings. I was incredibly fortunate to find Charissa Clark Howe, a gifted actress, to perform the terrific audiobook of PAPER DOLL. In the premiere novel, Jana Lane was the biggest child movie star ever until she was attacked on the studio lot at eighteen years old. In PAPER DOLL, Jana at thirty-eight lives with her family in a mansion in picturesque Hudson Valley, New York. Her flashbacks from the past become murder attempts in her future. Jana ventures back to Hollywood, which helps her uncover a web of secrets about everyone she loves. In PORCELAIN DOLL, the second mystery, Jana makes a comeback film and uncovers who is being murdered on the set and why. Her heart is set aflutter by her incredibly gorgeous romantic co-star, America’s heartthrob Jason Adonis. The other suspects include Jana’s James Dean type young co-star, her older John Wayne type co-star, her children’s Eve Harrington type nanny, the film’s gossipy makeup and hair artist, a local reverend trying to stop the film’s production, and Jason’s agent. I hit the jackpot for an audiobook performer with Derick Snow, an actor with a great deal of murder mystery acting experience. He not only connected with the mystery, humor, and mood of the novel, but also beautifully created the multitude of captivating and entertaining characters in Jana’s life in book two. His dramatic voice, crisp diction, and emotional availability bring the characters and story to life. Derick’s intensity is perfect for the many plot twists and turns, dropped clues and red herrings, sweet romance, and shocking yet gratifying ending. 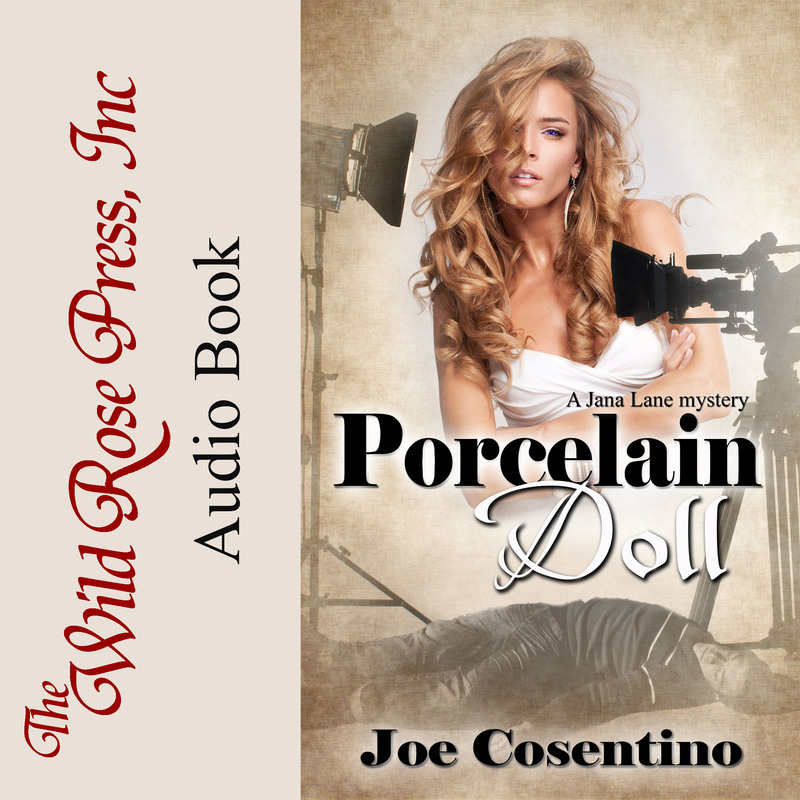 So now the audiobook of PAPER DOLL is now joined by the audiobook of PORCELAIN DOLL. Hopefully audiobooks of the remaining three novels will follow. In SATIN DOLL Jana heads to Washington, DC to play a US senator in a new film and becomes embroiled in murder and corruption at the Senate chamber. CHINA DOLL brings Jana to New York City to star in a Broadway thriller, facing murder on stage and off. Finally, in RAG DOLL Jana stars in a mystery television show and once again life imitates art.